US scientists have genetically engineered brewer’s yeast to make beer that has hoppier flavours without actually adding hops to give that effect. Charles Denby and Rachel Li from University of California, Berkeley, and colleagues inserted genes for enzymes so that yeast produces the flavour molecules linalool and geraniol, as well as ethanol. ‘We’re just scratching the surface of what is possible,’ Denby says, in terms of providing flavours that brewers might want to use. Brewers have long added hops to a boiling ‘wort’ mixture to get bitter flavours. 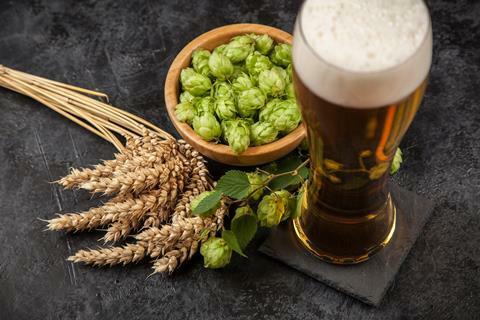 However, it’s recently become increasingly popular to also ‘dry hop’ beers, adding them later to exploit aroma compounds that otherwise boil off, such as linalool and geraniol. ‘Growing flavour and aroma hops is more natural resource intensive,’ Li explains. That’s because dry hopping in the US now consumes more hops than bittering, and flavourful varieties yield fewer hops. Denby and Li both initially worked in Jay Keasling’s Berkeley lab, which develops microbes to produce industrial chemicals like biofuels. Linalool was often involved, for example in making analogues to the jet fuel RJ-4. When Denby started homebrewing, the potential crossover hit him. But although the Berkeley team was already expert in making terpene molecules like linalool and geraniol with yeast, beer strains are different. Lab yeast has been bred to have a simple single-copy ‘haploid’ genome; yeast used in beer contains several copies of its genome. The scientists therefore needed to insert the genes for the enzymes that they want into every copy. And because they also wanted to make several different strains to compare and find the best one, ‘previous industry standard techniques would have been prohibitively laborious’, Denby says. By adopting the Crispr-Cas9 genome editing technique, the researchers made a first round of 18 strains, and investigated which factors gave the highest flavour molecule levels. One of the 30 second round strains then produced beer without dry hopping that a panel of 13 tasters felt tasted hoppier than commercial beers that are. Jane White from the International Centre for Brewing and Distilling at Heriot-Watt University in Edinburgh, UK, calls the approach ‘innovative’. Yet she’s sceptical that brewers will adopt it because it ‘removes the flexibility and craft in combining different hop varieties’. The approach may be more useful for aroma compounds ‘derived from animals or endangered plants and used in other industries such as perfume or cosmetics’, she adds. Using light to switch which enzymes brewer’s yeast produces boosts concentrations of biofuel candidate isobutanol fivefold.